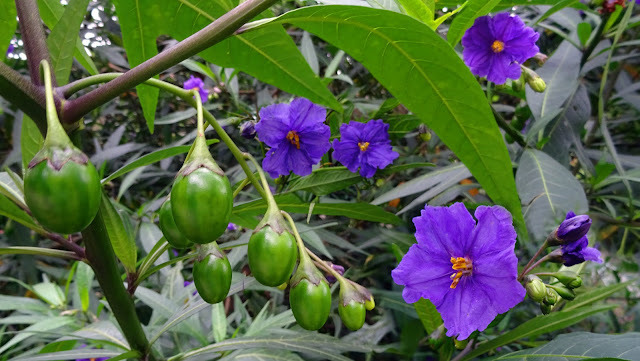 Solanum is the type genus of the family Solanaceae, which contains such well-known economic plants as the potato, tomato, tobacco, egg plant (aubergine) and many more. In Australia there are 117 species, of which 87 are endemic. Solanum laciniatum or Kangaroo Apple, a common name shared with the closely related S. aviculare, occurs in temperate regions of New South Wales, the Australian Capital Territory, Victoria, South Australia, Tasmania, New Zealand and associated islands on a range of soil types. It forms a large shrub 4 m high by 5 m wide. Solanum laciniatum produces two types of foliage: Large lance-shaped or irregularly lobed juvenile leaves 300 mm long by 250 mm wide and smaller generally entire lance-shaped adult leaves 150 mm long by about 30-50 mm wide. Both types of leaf are a rich dark green on the upper surface, and a lighter green underneath, with conspicuous veins. They are held on dark green succulent stems, which turn black, then a rough light-brown, with age. The five-petalled flowers are 30-50 mm across, bluish-purple, with bright yellow anthers. The flowers appear spasmodically in spring and summer in clusters of 3-5 in the leaf axils. The egg-shaped berries, 20-30 mm long, begin green and small when unripe and then become a bright orange-yellow with a warty appearance when ripe. The berries are poisonous while green, but edible once orange (then called the 'bush tomato'). The plant is also used as a rootstock for grafting eggplant. Solanum laciniatum has been cultivated at the Australian National Botanic Gardens since 1969, with no frost damage or major pest or disease problems apparent. As a fast-growing species, hardy in most soil types and conditions, except salt spray, S. laciniatum is ideally suited as a screen plant, in the understorey of a wind break, or for bank and erosion stabilisation. It has also been used in soils with a high concentration of heavy metals when reclaiming mine wastes. For the home gardener S. laciniatum is ideal as a quick growing screen plant, while slower shrubs are establishing. Since the mid 1960s S. laciniatum and S. aviculare have been cultivated and studied in the USSR, NZ, India, Egypt and other countries. The plants, and in particular the young foliage and green berries, contain a series of steroids (including the toxic alkaloid solasodine), which are of commercial value as raw material for the manufacture of contraceptives. Wow! What an amazing plant. Beautiful flowers and berries, and edible once ripe, but poisonous when green... What do they taste like? Tomatoes? Yet another interesting plant that I've never seem before. Wonderful blue flowers with berries. The flowers and fruits are really pretty. solanum, thought I recognized it. A beautiful flower which brings great food. I've never seen this before, thanks for showing! Beautiful flowers and berries.The name is very special..
Never seen this. - Thank you for showing and info. Those beeries look very interesting. The berries look like small (green) eggplants....have a wonderful weekend! Enjoy! WOW, what wonderful flowers and a very interesting name! I enjoy this challenge and will post some of my pictures. I have seen this plant several times. I didn't grow it because of it poisonous qualities. Very beautiful ! As usual, I didn't know this plant before. This week I participate with pictures from my garden in octobre. Such a funny name, dear Nick. I've never seem before. Contraceptives? I'd never thought that! Beautiful blue flowers. Blue can be so difficult to take good pictures of. Yours is great.